Note: This study has been extended and revised after been presented in 2nd International Energy and Engineering Conference, 12-13 October 2017, Gaziantep University, TURKEY. It was previously published as abstract text report in the Book of the conference. The chemical and mechanical properties of the eight different composite materials tested in this study are shown in [Table 1] (information provided by the manufacturer company). Five standardized disc shape specimens (2 mm diameter × 2 mm height) were prepared from eight composite materials (Grandio, Estelite Flow, Filtek Bulk-fill, Charisma, Clearfil, Ultimate, Quadrant and G-aenial for each artificial aging environment. Composite specimens were immersed during 7, 90, and 180 days in artificial saliva and distill water at 37°C, respectively. 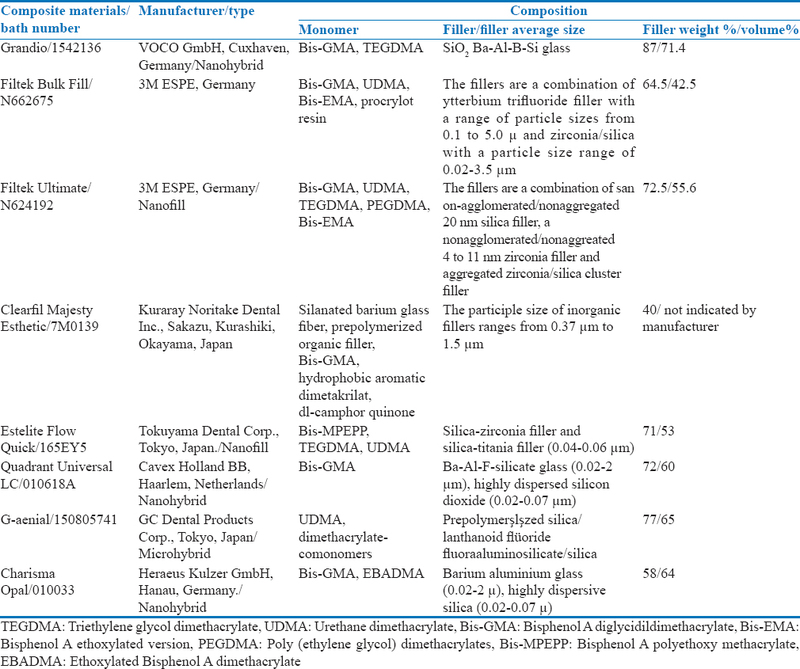 [Table 2] shows the chemical components of the saliva solution used in this study. The Vicker's hardness and surface roughness values of the samples were measured using 2D and 3D profilometer after each artificial aging period. In addition to a random specimen was selected from each test group and scanning electron microscope images were taken for the analysis of microstructure degradation. [Figure 1] shows the surface roughness of composite materials tested in this study in distill water and artificial saliva ambient at 37°C temperature, respectively. When the surface roughness values of composite materials were examined, it will be seen that surface roughness values of all composite materials increased after 7 days of aging [Figure 2] and three shows the Vicker's hardness of composite materials in this study in distill water and artificial saliva ambient at 37°C temperature, respectively. When [Figure 2] and [Figure 3] are examined, it will be seen that all composite materials show a significant increase in hardness values especially after 7 days of artificial aging immersed distill water. The rate of increase was the highest in the Filtek Bulk-Fill composite material and the least increase was in the Charisma composite material. However, the 90 and 180 days artificial aging times generally did not change the hardness value of the composite materials. [Figure 4] shows the example of the mechanism of degradation of the artificial aging process in the microstructure of the composite material. Among the composite materials tested in this study, bulk-fill and resin-based composite materials have similar mechanical behavior after all artificial aging medium and time protocol process. Briso AL, Caruzo LP, Guedes AP, Catelan A, dos Santos PH. In vitro evaluation of surface roughness and microhardness of restorative materials submitted to erosive challenges. Oper Dent 2011;36:397-402. Bayne SC, Heymann HO, Swift EJ Jr. Update on dental composite restorations. J Am Dent Assoc 1994;125:687-701. Hahnel S, Henrich A, Bürgers R, Handel G, Rosentritt M. Investigation of mechanical properties of modern dental composites after artificial aging for one year. Oper Dent 2010;35:412-9. Manhart J, Kunzelmann KH, Chen HY, Hickel R. Mechanical properties of new composite restorative materials. J Biomed Mater Res 2000;53:353-61. Drummond JL. 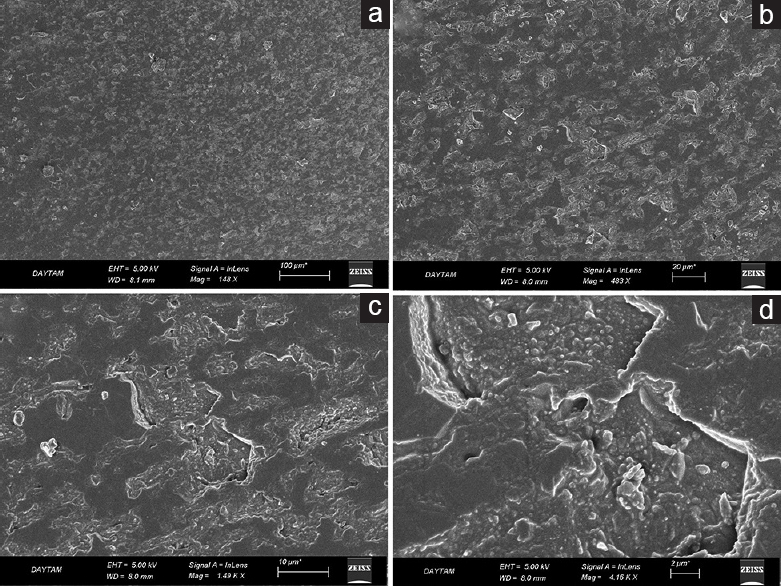 Degradation, fatigue, and failure of resin dental composite materials. J Dent Res 2008;87:710-9. Giannini M, Di Francescantonio M, Pacheco RR, Cidreira Boaro LC, Braga RR. Characterization of water sorption, solubility, and roughness of silorane- and methacrylate-based composite resins. Oper Dent 2014;39:264-72. Scheibe KG, Almeida KG, Medeiros IS, Costa JF, Alves CM. Effect of different polishing systems on the surface roughness of microhybrid composites. J Appl Oral Sci 2009;17:21-6. Viennot S, Lissac M, Malquarti G, Dalard F, Grosgogeat B. Influence of casting procedures on the corrosion resistance of clinical dental alloys containing palladium. Acta Biomater 2006;2:321-30. Sauza JC, Bentes AC, Reis K, Gavinha S, Buciumeanu M, Henriques B, et al. Abrasive and dental restorations sliding wear of resin composites for. Tribol Int 2016;102:154-60. Yilmaz EC, Sadeler R. Investigation of two- and three-body wear resistance on flowable bulk-fill and resin-based composites. Mech Composite Mater 2018;54:395-402. Yilmaz EC, Sadeler R. Investigation of three-body wear of dental materials under different chewing cycles. Sci Eng Composite Mater 2018;25:781-7. Sevimay M, Yucel MT, Tak O. Influence of food simulating solutions on the hardness of composite resins. J Composite Mater 2008;42:69-75. Sideridou ID, Karabela MM, Bikiaris DN. Aging studies of light cured dimethacrylate-based dental resins and a resin composite in water or ethanol/water. Dent Mater 2007;23:1142-9. Yilmaz E, Sadeler R, Duymus ZY, Ocal M. Effects of two-body wear on microfill, nanofill, and nanohybrid restorative composites. Biomed Biotechnol Res J 2017;1:25-8. Yilmaz E, Sadeler R, Duymus ZY, Özdogan A. 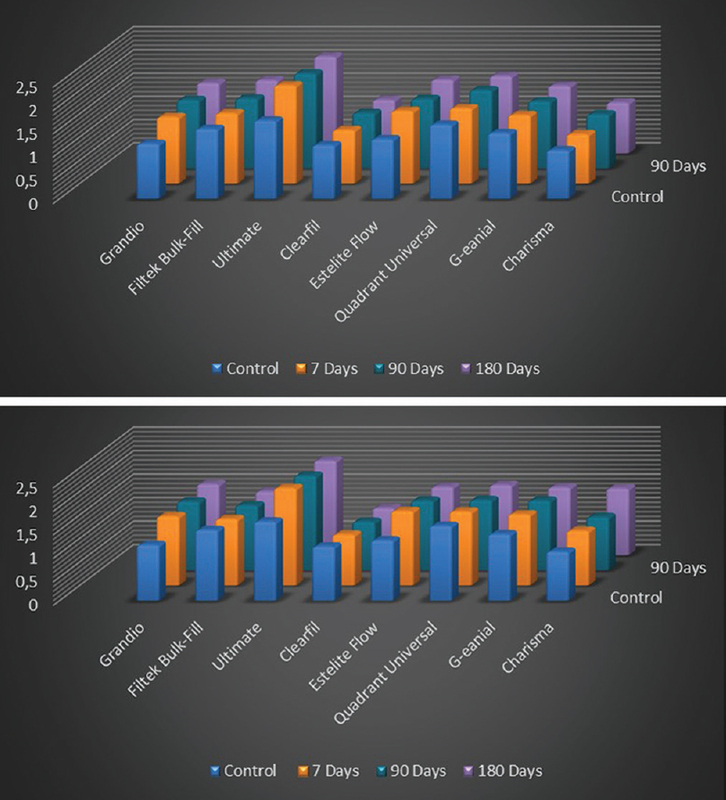 Effect of ambient pH and different chewing cycle of contact wear on dental composite material. Dentistry and Medical Research, 2018;6:46-50.